The Mahsa Icefield is at the headwaters of Takatz Creek. This is a small glacier, not an actual icefield. Five kilometers to the west is another small unnamed glacier at the headwaters of Sawmill Creek. 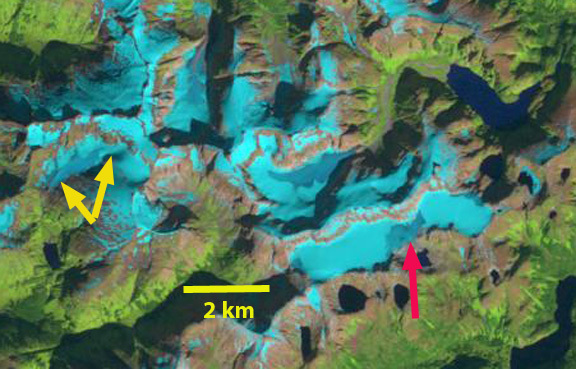 Here we focus on changes in the two glacier using Landsat images from 1986 to 2014. In 1986 the Mahsa Icefield is a contiguous glacier that extended 5 km from east to west, red arrow indicates the mid-section of the icefield. 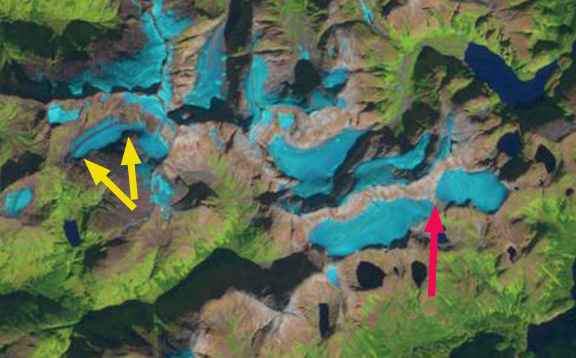 A separate glacier in Sawmill Creek, yellow arrows, was 2.1 km long and has no lake at its terminus. In 1997 the Mahsa Icefield has separated into an east and west half, at the red arrow, and has lost all of its snowcover. The glacier in Sawmill Creek is still a single ice mass, but has lost all of its snowcover, which happened in 1998, 2003 and 2004. 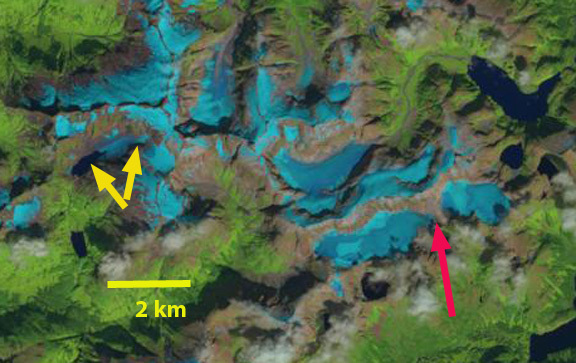 In 2014 the Mahsa Icefield’s east and west half are separated by 300 m, red arrow. There is very little snowcover remaining despite there is a month left in the melt season. At the headwaters of Sawmill Creek a lake has formed as the glacier has retreated, the lake is 600 m long in 2014. The glacier has also separated into a small upper and lower section. This glacier has lost half of its area since 1986. The retreat of these glaciers on Baranof Island is similar to the retreat of nearby Carbon Lake Glacier,Lemon Creek Glacier, and Sinclair Glacier. Lemon Creek Glacier has lost more than 25 m of glacier thickness during the 1953-2014 period when its mass balance has been observed by the Juneau Icefield Research Program, and has retreated more than 1 km (Pelto et al, 2014).